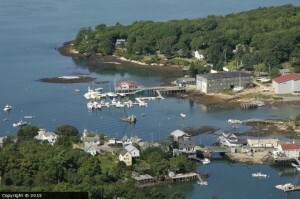 Gamage Shipyard sits on a quiet cove on the South Bristol Gut, just off midcoast Maine’s beautiful Damariscotta River. Pemaquid Point Lighthouse stands just across John’s Bay, Christmas Cove is around the corner, and it’s only a few nautical miles to Boothbay Harbor. Set between Casco Bay to the west, and Muscongus and Penobscot bays to the east, the cruising grounds in this part of Maine are spectacular.